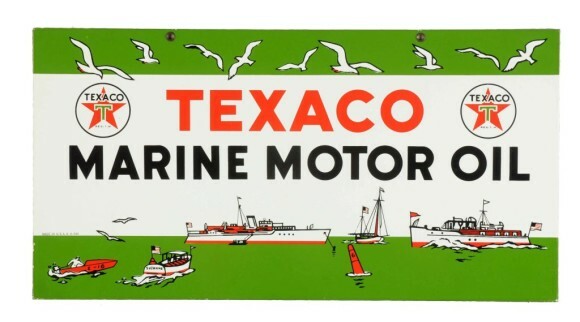 This Texaco Marine Motor Oil is the exact same design as the Texaco Marine Lubrication. The only difference in the two is the text. This sign has a green stripe along the top, and green ocean water at the bottom. On the top stripe, sea gulls are flying. There are nine sea gulls in total. On the lower green bar are several different methods of marine transportation. This is a DSP sign and measures 11″ x 22″. This sign was produced in 1953, per the stamp at the center, left.